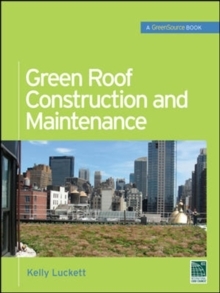 A Complete Guide to Building and Maintaining Green RoofsWritten by an industry expert in green roof design and installation, this GreenSource book presents all of the information you need to skillfully design, construct, and maintain green roofs. You will find a wealth of practical details gathered through real-world implementations and independent research.Green Roof Construction and Maintenance explains how to design a green roof, plan for irrigation and drainage, select and place soil and plants, and maintain the entire setup. 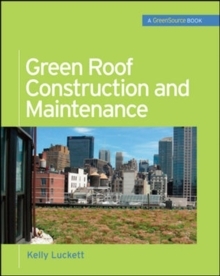 The book also discusses return on investment, LEED design specifications, and the myriad short- and long-term environmental benefits of green roofs. Filled with step-by-step illustrations and full-color photographs, this is a valuable, hands-on guide to a rapidly emerging trend in the sustainability movement.